Some might ask: dear author of this fine list, how about prior to diving into all of the reasons you might want to buy one of the light meters on your list, tell us what a light meter is will you? To them I say, but of course. In both still and video capture there are a few different settings and numbers that we always have to be aware of, and manipulating during shoots. We won’t get into strenuous details here regarding what they all do, but they are, by name; Aperture, ISO, and Shutter Speed. There are plenty of amazing tutorials and explanations of all three of these things only from reputable sources (and some from unknown sources). Often, during film shoots or photo sessions, there is an undying necessity to avoid having to do things that are considered extra. In this scenario, we’re using a tool that will remove the need to shoot, then check over playback, adjust, then shoot more. In a stress-free environment, plenty of photographers and cinematographers prefer doing all of this extra work because it can bring more life to the process of capturing. But if there is a time crunch, or people are depending on your efficiency, you’ll want to avoid the elongated process. A light meter takes in your desired end product — usually this is to be “perfectly exposed” — and it is held up next to your subject, where it reads the environmental light (natural or otherwise) and spits out the exact numbers you will need to set your camera equipment to in order to find that perfect exposure. Here are the ten best on the market today (with a focus on variety in price and ability). We don’t normally like to come out of the sage absolutely swinging for the fences, because the best products on the market are generally the ones that can do the given task the best, not the ones with the most flash. But the Sekonic Speedmaster is the best of those two worlds. It may just be the best Light Meter ever made, let alone available right now. It’s pricey, but has a brilliantly jewel encrusted crown of capabilities. It’s the most deluxe product, and for very good reason, the number one product on our list. In almost every single case, the light meter and the spot finder are two different items. The light meter, when held up next to a subject will display the current light readings, and give the operator the perfect settings for an optimal exposure. The spot finder is more of a monocular, that can target a sport from far away, giving you the ability to see light data on a mark without having to be right next to it. Having the spot finder built into the Speedmaster L-858D-U makes it more than a single tool. Studio lights are an ever growing arsenal that help you (assuming you get good reads from your light meter) adjust the environment light. Photographers also often employ the help of remote flashes to spruce up a shot on the trigger, but without filling the room with the light at all times. There are many reasons to employ remote flashes. The Sekonic Speedmaster L-858D-U is an astounding tool that not only can connect with your remote flash trigger (in order to properly read the light during a flash while you’re away from your camera, next to your subject) but it can also sync with most of the world’s most popular brands of ambient lights, allowing you to control all the aspects of the environment light all from the touchscreen of the handheld device itself. There is most definitely no scenario in which someone would use the word value in relation to the Sekonic Speedmaster. It’s nearly six hundred dollars. For the price of a fantastic portrait lens, you can snag this light meter. But there’s no denying that it is both the king and queen of the light meter prom, and can become more of a control center than just the simple thing it’s name suggest. Everything went digital a while back -- okay, well not everything, you can still shoot in analog, it’s just uncommon now -- and if you’re one of the few that shoot on one of Nikon or Canon’s full-frame DSLR’s that include built-in WiFi connected to your smartphones, the device in your pocket is more important to your shoot than you might think. Now, with the Lumu Power Light and Color Meter for iPhone, you can use Lumulabs’ proprietary application to measure your light as if your phone were a standalone light meter. It’s great! Most light meters on the market can do a few things really well but the Lumu Power Light and Color Meter for iPhone boasts a double-sided meter face and six full modes of metering. The ambient mode to measure ambient light. The flash mode that covers your level and times of flash. A cine/video mode that measures exposure for moving objects. Illuminance mode that controls and displays source lights. On the flip side of the domed sensor is a flat one, that can measure color temperature and white balance. Six measurement modes, in one simple plug-in for your phone. There’s a lot to be said about reducing the weight of your carry load when shooting anything. The heavier your gear bag is the less likely you’re going to want to carry all of your stuff around, and you will either get tired, or you won’t go all together. Both of those can get in the way of a perfect shot. The Lumu Power Light and Color Meter is as big as a silver dollar, and weighs almost nothing. This is an essential piece of kit that you won’t even notice you’re carrying around with you. As for the phone it plugs into? Well, you’re almost always going to have than on your person anyways, right? At just over two hundred bucks, no one is going to jump for joy at the cost of this little sensor that fits easily in any of your pockets. But maybe they should. This is a robust tool at a fraction of the size that most are, and can do an extremely amazing job, all while only needing a smartphone to get it done. There’s a ton of value in the quality and convenience of this light meter, but the cost will scare most away. The amazingly high precision light meter and ambient temperature measurement device could be the nicest and cooled meter you can add to your kit. It’s the absolutely beautiful side of the simplified market variety, but it has a few sort of unique tricks up its sleeve. Urceri isn’t a household name when it comes to tools around the abode, but they do have a fine pedigree for decently made cheap tools. There has been a lot of hours poured over the shooting of models, or the capturing of a scripted moment, and all the hands at work are so fervently focused on getting the one thing that they came for, so much so it is easy to forget about the comforts of those standing in front of the camera. 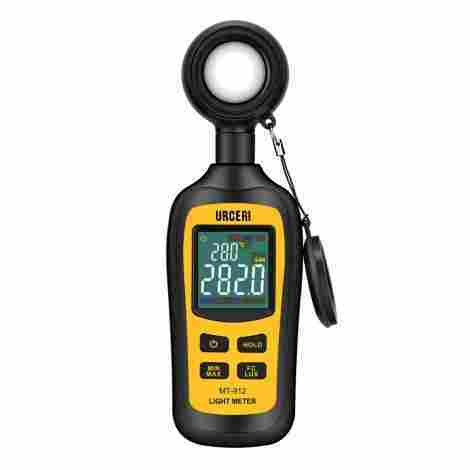 Luckily, the URCERI Handheld Digital Light Meter also comes with a display for ambient temperature. You can simultaneously check on your light level, whilst also ensuring the comfort of your star or subject. A fundamental part of purchasing a budget piece of kit is the assurance that it will last a little longer than you might assume. There is very little cross section for budget and quality. But URCERI seems to have struck the right cord here as there are few if no complaints from end users about the make of the materials. A budget tool with an exemplary use of quality materials, that has a few beautiful extra little zips applied to its jacket is like a unicorn. How can you say no to a unicorn priced this low? Sure, you may have to replace it with a new one a lot sooner than if you were to spend four hundred on a light meter. Here’s a wonderful product from a company we’ve seen on this list before, that does a ton less, but with the same gusto and important on quality manufacturing as any other product in their premium line-up. And at a hundred dollars less than the insanely over-capable L-858D-U, this L-308X has a lot less flash, but does the light meter job extremely well. With a hard tilt on gauging proper aperture levels, the photo mode on the Flashmate Light Meter by Sekonic has a brilliant ability to assist still image photographers on their journey to capture the perfect photo. There’s no shaking around the bush of polaroids here -- sidebar … don’t shake your polaroids kids … it’s not good for them -- the shutter and aperture focus, with a flash function range, this little device makes your life capturing stills that much sweeter. Built on a slider, the lumisphere (the round white thing that you want to stick into the light to get a measurement) can be moved to reveal a indented sensor that can measure incident light, with an attachable disc that will properly measure the light off of flat objects. It’s not often that light meters are capable of hitting all three of these types of light measurements out of the park as easily, and as accurately as the 308X from Sekonic can. A few extra dollars will buy you the absolute best, simple light meter that you could ever find, from (inarguably) one of the best brands on the market today. Things that hold your camera gear upwards while working and meters are the two most important thing to not cheap out on. So is there a value with the L-308X? Yes. But it’s going to lose some buyers based on the suggested retail price alone. Did somebody call for a Doctor? No? Was that joke super dumb? Yes. Well! Let’s move on shall we! The Dr.Meter LX*a bunch of numbers* is the first of a few very well reviewed and adored budget light meters. It has -- oddly enough -- a weird wired remote with a spring wall mounted phone like cable attaching it to the reader. It’s an odd bit of kit, but at this price point, and with this accuracy, you can’t really complain. In most measuring tools, things that have to adjust to every given scenario, like scales or the like, there is an annoying need to continually calibrate zero over and over again. With light meters, you must constantly be readjusting what zero is and this product automatically zeroes when introduced to an environment. If there is something to be considered when trying to decide whether to go on the expensive end of the spectrum or the lower, it is important to consider the reliability of consumption. If you’ve got a thousand bells and a few whistles, that little battery powering the touchscreen, LED display is going to burn down way faster than you’d probably like it to. But if you get a simplified meter for your kit, you can guarantee that a simple display, and no spice, will keep from burning through your charge in a short time. Don’t arrive at a shoot only to have no light meter. The doctor is seeing patients, and his cost of light appraisal is extremely cheap. While everything else so far on this list is north of the two hundred dollar mark, this easy to use, uncomplicated in its glory, piece of kit is just a small fraction of that price. It even comes with a one year manufacturer's warranty. It does the job, extremely well, and won’t break the bank. Here we have another stellar performance tool to add to your kit that is slightly above the budget prices of some of the simpler light meters but doesn’t skimp on the express awesomeness of doing the best at what it needs to do. The Dawson Tools DSM150 Digital Light Meter doesn’t have a bunch of flash or flamboyant additions, it’s just a simple tool, made very well, with a price that doesn’t make you nervous about the quality of the materials within it. There’s a lot of things displayed on a light meter. Some brands and makes offer a simplified look at the numbers in regards to lux readings, or suggested aperture yada yada, but it can get to be quite a bit. The Bar graph on the Dawson Tools DSM150 shows from a zero point to a max reading on a bar graph that is extremely easy to read and understand. It’s crazy easy to see if you’re looking at twenty-five percent max light. It’s so easy, it’s such a great touch to the tech. Hey, we get it. There are a million tiny things, and a million numbers that correspond to those million tiny things. It’s a lot of things to keep intact, to keep on your mind, to keep keen to continuously learn more about and refresh on. So when a light meter -- easily one of the most “tiny millions of things” type of tools -- comes to the table with an elegant simplicity, it’s worth noticing. A mid-range price point for an extremely useful and well made light meter is a pretty great value. Like we mentioned a moment ago, it’s nice to pay above budget prices because it puts the cloud of ease over your shopper's mind, which is a hard thing to overcome. But if you’re paying twice what a budget meter would cost you, that worry vanishes. The Dawson Tools DSM150 is a great value. It couldn’t get any simpler, you say? Well you’d be mighty close, but just a touch wrong. This here is the Extech Pocket Sized Candle Light Meter and it sure doesn’t do a whole lot. But what it can do is measure light. Considering that the title of this list is Best Light Meters, this qualifies. There’s no inch of deluxe on this lux sensor. It’s a straightforward light measurement device with two ranges, and an on/off switch. Forty seven inches of leash on this bad boy! Can you believe that?! The remote sensor on the Extech 401027 -- as an aside, light meters sure do like their long seemingly meaningless numbers in their names don’t they? -- extends away from the reader, giving you the ability to hold the sensor in awkward locations while still being able to hold the reader near your face (your reader reading tool, your face is). Simple things mean simpler times, which trickle down into making your day easier. Now, the simplified nature of the Extech can go a little too far into the nothing realm, as you will literally only be able to see the level of light in your current setting (or wherever you stick the sensor) and there is not a single addition number to be found on your device. Easy might be just that, but it could be a downfall in this case. 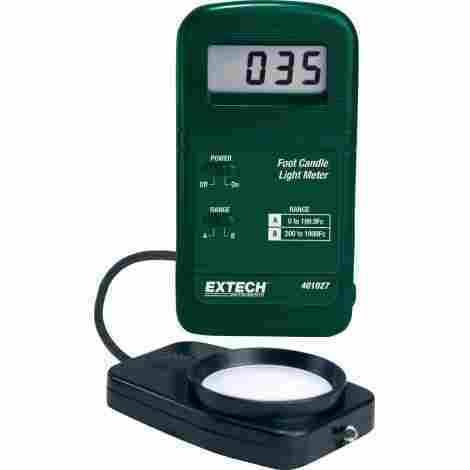 The Extech 401027 Pocket Sized Candle Light Meter is exuberant overpriced for what it can do, especially when compared to some of the other options on this list. If you’re looking for a single things -- the measurement of light -- without the flash and pomp that some manufacturers meddle with, the Extech might be your only option, let alone the best. For a few dollars less (the Extech 401027 is roughly a hundred bucks), you can easily find a a decent meter that does a little bit more. 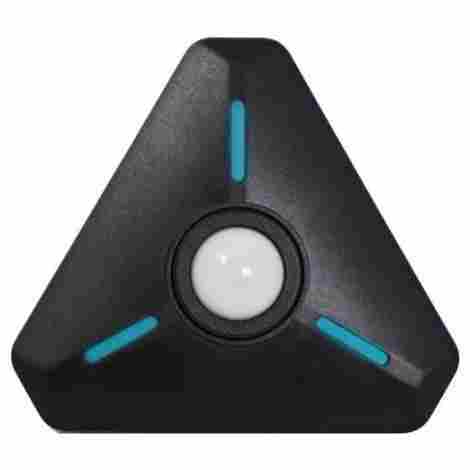 While the last item on this list is probably the best product on the market for mobile shooting, the Illuminati Instruments Wireless Light Meter is an essential light meter for those that might have a spot to put a meter permanently, or semi-permanently. Like a studio perhaps? If you shoot a lot in the same area, the Illuminati is a wonderful stand-still option, and can easily be mounted on a common surface or hung. There aren’t a ton of really fussy things in the photography world. Even light meters aren’t really that big of a hassle to use. And they sure as heck beat the idea that you would have to instead take a ton of tests on your camera yourself and adjust as needed. So when the Illuminati Instruments company set out to build a light and color meter that one would put in their studio, the made it wireless so that cinematographers and photographers alike can read the output on their mobile phone via the application they’ve designed. It’s brilliant. *overdramatic alert* The Illuminati application -- used to read the information provided by the meter that we just mentioned in the last talking point -- is so great. It can, and will easily, accept the signal from multiple of Illuminati’s meters. So if you’re looking to build a dynamic light scenario, with multiple wireless light meters, you can read and control them all on a single app, with a single phone. Everything at the top of this list is fairly pricey compared to what’s coming below, but as they are a brilliant tool in your kit, it’s important that the tech you use is of the utmost quality, because there’s a lot of computer parts within them. The cheaper down the scale you get, the more fragile the use. Priced higher than other options on our list, this exuberantly ideal studio light meter is a premium standstill option. Now you might be saying “dear faceless name on the internet, writing me this guide, why art thou thrusting a nearly identical option strung together immediately” and to that I say … it’s our list. Let me do my thing. 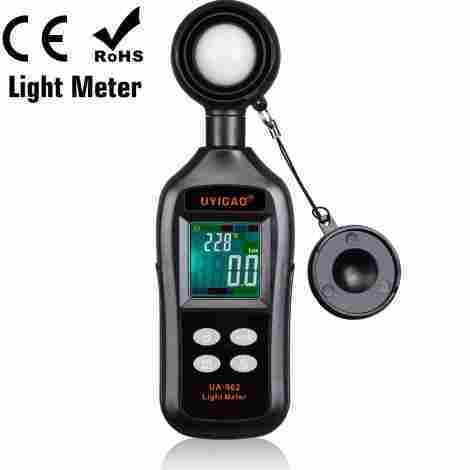 The digital light illuminance meter by UYIGAO is, on the surface, almost the exact same thing, for the exact same price. 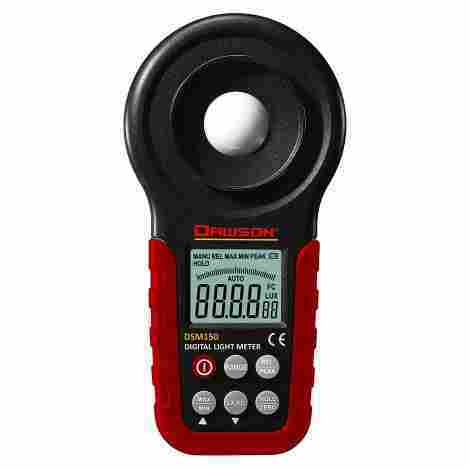 But as we thought the first one was a perfect budget option, without a famous name to its face, we thought it appropriate to offer something very similar from a company that is often brought up when in talks of meters and measurement tools. It might be an extremely simple thing. It might be something that is commonly added to a ton of electronic tools or otherwise. But in the case of a piece of kit that we shouldn’t walk out of the home without, that can help your job so darn much, it’s key to not run out of batteries during or even on the way to a shoot. The UYIGAO Lightmeter has a wonderful stress saving auto-off function that will save battery if put into the dark (in your case) or unused for x-amount of time. There is also a low-battery indicator on the screen that will warn you if you’re getting close to lifelessness. Extraordinarily uncomplicated is a beautiful and welcoming thing. Especially when it comes to hobbies or jobs that involve the ever-evolving, and insanely complex world of camera gear and camera accessories. The UYIGAO, much like some of our other simple additions to our list, it fantastic at the one thing you want it for, and doesn't bog down your brain, or the tool itself with much else. One low price for a great, and reliable digital light meter is a steal. The manufacturer, known for their exemplary display of design in the “all sorts of measurement tools” world, has done a fabulous job of quality and the price you will pay for such a thing isn’t complicated, much like it’s use case. And at long last, we have another budget choice that squeaks into our top ten list with its incessant ability to do it’s job at a wonderful pace, without fail, and without all of the flashy bits. 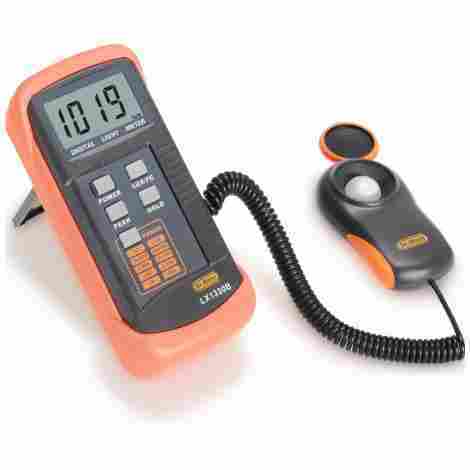 The Leaton Digital Luxmeter has a wonderful range -- three to be exact -- and is small enough to fit into any kit. Though it’s not a strictly unique ability to this device, it’s one that a lot of budget light meters won’t be able to accomplish. 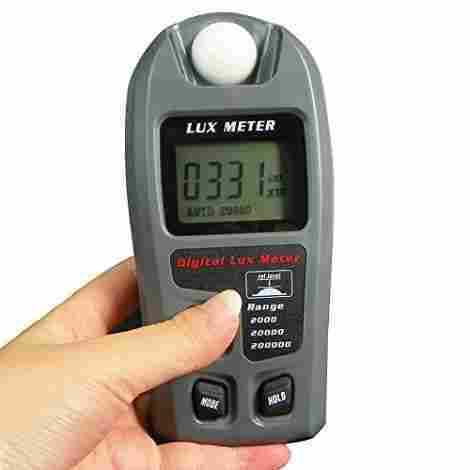 The Leaton Digital Luxmeter has the ability to accurately measure the light up to two hundred thousand lux. The sun, unobstructed, that causes your eyes pain at noon in the sky, can reach up to one hundred and twenty thousand lux. So we’re talking nearly twice the light power of the sun at its brightest from this far away. That’s a lot of light. What might be surprising, is that this simple and stripped down piece has the ability to do quite a bit. There is a hold function that will hold your current reading in place, or hold to a certain setting. There is an auto range that will detect the normalcy of ambient light and select one of its three lux ranges to read at. Even a manual range setting that will allow you to choose your ranges yourself. There’s an auto-off to save battery and a low battery indicator. For something budget, it sure has some flair for personality. Less than the price of going out to eat to get the spunkiest little light meter on the market is of great value. Leaton doesn't boast a history of manufacturers tales that claim to use high-quality materials. Yes, you’ll be getting a meter that does a little bit more than it might have the right to be able to. But it’s a budget tool for a reason. There are a ton of fun and essential tools for your kit when it comes to capturing images, moving or still, and the light meter is a great piece of kit that will assist you in nearly everything you do when you have both the ability to control your gear to its utmost, or control your surrounding environment. We attempted to put a lot of options on the table for your meal here. A veritable buffet of kit additions from a wide range of manufacturers, items of all areas on the scale of budget to premium, extensive to simple. When it comes to electronics or anything that has to do with sensors, screens for reading information, or battery powered tools, it’s important to understand the build and make of the pieces that go into this thing that you’re buying. In the case of light meters — a tool that is going to simplify and help you on your journey to perfect still or moving pictures — it’s even more so important to continuously search out the best of the best available. Some things don’t really matter all that much when it comes to the build. The body? We all baby our gear so much, and our kits usually have walls lined with softness to ensure no damage is done to the thousands of dollars worth of camera or shooting gear. So does it really matter what that body of your light meter is made out of? Probably not. Many of our options, even the more average ones that have swum out of the pools of budget worlds, have plastic bodies. What you do need to pay close attention to in the ways of make and materials are the pedigree of the company designing and manufacturing the light meter. There’s nothing fancy to seek here. Just a normalized pattern of doing a good job. The history of a company will go a long way in easing your mind of the internal components of a piece of closed off electronics. Especially when you consider that most consumers aren’t going to pry open their tools and inspect the innards to ensure a quality weld or a quality board. The make of the sensor is the most important part of a light meter as that is the aspect of this tool that does the thing you own the tool to do. So if you see something suspect, or overtly cheap in the look of a lumisphere, don’t buy it! As with almost every list that we create here at Gear Hunt, there’s an undeniable need to include as much variety regardless of us listing things into a top ten box. On paper, you wouldn’t really expect there to be a lot of variety in the world of light meters but you’d be crazy wrong. There are devices that have detachable sensors on cables. There are meters with a thousand things built into them that make all other aspects of measurement a little bit easier — kind of like a light measuring multi-tool. There’s a surprisingly pleasurable amount of variety on the marketplace if your search begins with the ability to measure light. So, we attempted to place a bunch of different types of flare on this list. Some of our chosen items stand out because of the fact that they don’t stand out at all. Yeah. That made sense. But you know what I mean. Often designers and manufacturers can get a little overzealous when putting together the perfect piece of kit, and some folks would rather just get the simplest option. 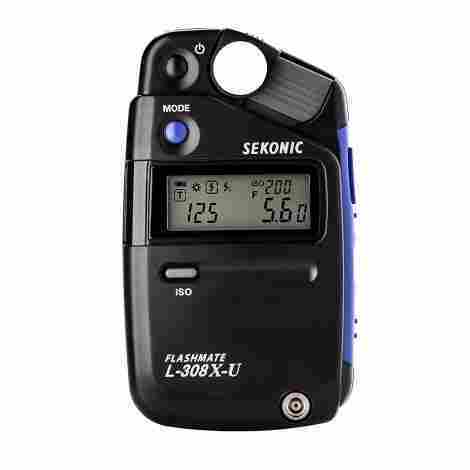 As with every market, there’s a median price for a generally awesome light meter. If you’re heading along the average path, you’re going to be looking at a price point that hovers around the sixty to one hundred dollar range. If you’re swimming around in the budget pool of products, you should be prepared to spend a lot less, which is why you’re here right? But also possibly replace this tool a lot sooner than you might have otherwise if you went with a more premium product. The math, over the course of the next ten years or so, might even out. So it’s totally your call as to which path to take. 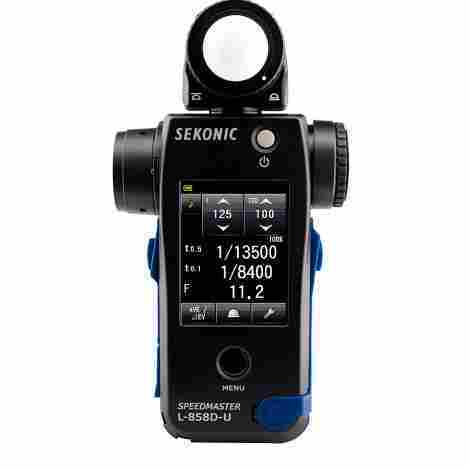 The premium end of the spectrum, products like our Sekonic Speedmaster at number one on our list is an insanely capable device that does far more than any light meter ever should have aspired to do. Yet here we are, with options like it. Q: What is a lux? A: Great question. Though, if you’re asking that question, perhaps you’re not at the stage where you will understand a light meter just yet, and a bit of research and learning should be your next step. A Lux is a measurement of amounts of lumens per square meter. It’s a way of conducting a reading of illuminance in units. A lumen is simply the amount of light in flux at any given time. This used to be measured in terms of “candles” or one candela, but has since evolved into the measurement of Lux, and in essence Lumens. If you check your household light bulbs, they will most likely display a lumen number, informing you of it’s intended brightness. Q: What is the lux range? A: That’s a bit of a tricky question to answer. Common ranges for budget to average light meters usually goes from 0-200 lux, 200-2000 lux, and upwards of 200,000 lux. While premium models might go far beyond that, and even more premium models might go far below that (not into negative, but into miniscule measurements). To be clear, you’re going to be very safe with nearly anything provided on the market today. Unless you’re measure light in a really unique atmosphere, you will be alright with the average ranges used. A: To be honest, spend as much as you can. Other than the camera and lenses themselves, there aren’t a lot of photography accessories (non-mechanical) that you need to spend a great deal on. But the more you spend, the better every aspect of your light meter will be. The longer your light meter will last. The more your light meter will be able to do. Considering the amount of ease a great light meter will add to your working day, why wouldn’t you spend as much as you can reasonably afford? Q: What do the weird names for light ? A: There are, in the simplest of terms, three different types of light measuring that often come into play with light meters. 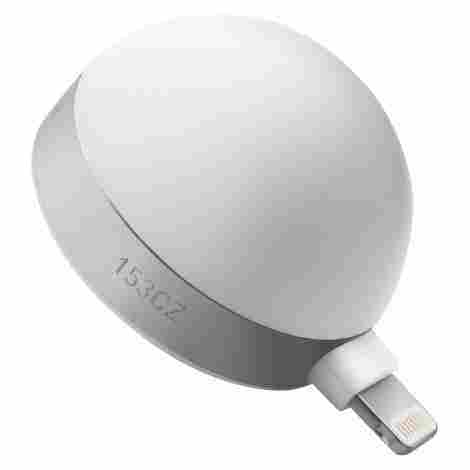 The first, is ambient, and uses the normal looking half ping-pong ball looking lumisphere to measure the ambient light wherever it is held or placed. The second is incident light which is the measurement of light in a concave shape or “inside a shape”. These sensors are usually within a divot on the device, and measure the light that gets into spaces or holes. The third is flat, reflective, or “spot” light. This measures the light that bounces off of a flat object. Fancier light meters will have a spot finder (the eye-port thing) while others will have a replaceable lumisphere that you can then attach a lumidisc to (which is just a flat surface). All three of these types of light are important to measure if you’re looking at a full scene.